Lithuanians started traveling to the caves actively in 1970’s. Especially large activity was from 1980 until 1991. At this period Lithuanian speleologists were known and valued in all the Soviet Union. Later there was a long period of stagnation. Lithuanians still traveled to the caves, but there was no strong team, nor organized activity. Through the last few years speleology in Lithuania is experiencing its rebirth. In 2006 we founded the caving club Aenigma (in Latin aenigma means “a secret, a mistery”) that at this moment is the largest and the most active speleological organization in the Baltic States consisting of more than 30 members. At this moment the caving club Aenigma unites the cavers from the various cities and towns of Lithuania: Vilnius, Kaunas, Panevėžys, Klaipėda, Varėna and others. We are proud of that such speleo veterans like Erikas Laiconas, Vytautas Gudaitis, Raimondas Daniūnas, Gintautas Švedas and others are still participating in our activities. The main objectives of the caving club Aenigma are to explore the caves and unite those who are interested in the amazing underground world. Every year new cavers are prepared in the caving school. We are aiming to create a strong and unified team that could work even in the deepest cave of the world. Every year we organize or participate in a number of expeditions to various countries: Russia, Ukraine, Abkhazia, Poland, Spain, France, Turkey and others. In our expeditions we pay a great attention to the ecology. Also we look after and periodically clean the Lithuanian cave the Cow’s Cave. Because of its geographical position and historical aspects Lithuania often becomes a bridge between the East and the West. 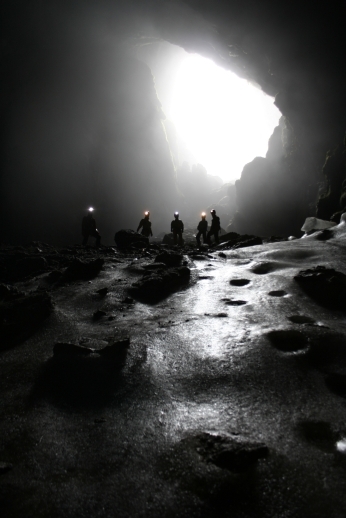 The speleology is not an exception. We collaborate with the cavers of Eastern Europe (Russia, Ukraine) and with the ones of the West (France, Spain, Poland). Every country has its own speleological traditions and Lithuanian cavers have an opportunity to adopt a useful experience from the one side and transfer it to the other side. You can contact us by e-mail info[eta]speleo.lt, taryba[eta]speleo.lt or by phone +370 686 17481.